Why go to Itacoatiara Beach? I definitely recommend you visit Itacoatiara Beach. Undoubtedly it is one of the most beautiful beaches in Rio de Janeiro, where you will be able to relax surrounded by stunning nature, but also enjoy a day full of fun and adventures. If that is what you are seeking then whether you are a surf lover or not, Itacoatiara is a beautiful off the beaten track experience, for all ages. Itacoatiara is a suburb located in the Ocean Zone of Niteroi, one of Rio’s biggest neighbour cities, just across the Guanabara Bay (Baía de Guanabara). It is considered by many as the best beach in Rio. Its name “Itacoatiara” comes from the Tupi language, one of the ancient indigenous tribes that used to live around Rio, and it means “Scratched Stone” because of how it looks. “Itacoá“, as the locals call it, is famous for its natural beauties, hikes and big waves, perfect for adventure seekers. It is protected by the Serra da Tiririca National Park, which makes the suburb surrounded by beautiful mountains. It is easy and cheap to get to Itacoatiara from Rio downtown. Go to the ferry station, in Praça XV and buy a ticket to Niteroi – Arariboia Station. They leave each 20 minutes on week days, 30 minutes on Saturdays and hourly on Sundays. The fare costs R$6,30. Arriving in Niteroi, when you leave the ferry station, walk towards your left side for approximately 10 minutes and you will find the bus depot. It is big and well signalised. You will need to take the bus number 38 – ITAIPU. Pay attention to the destination, because there might be another bus with the same number. Only the 38 – ITAIPU will take you to Itacoatiara. The bus fare is R$3,90. The trip takes about 30 minutes (11km according to google maps) and during the way you will be able to see the beautiful beaches of Praia das Flechas, Icaraí and São Francisco. They all have an amazing view of Rio´s Zona Sul. If you are not sure on where to get off the bus, I suggest you follow your path on google maps (I Always do that when I am in unknown zones). If it is not possible, just ask the driver to show you. You will probably see a number of people in their swim suits and happy smiles getting off the bus anyway, that is a lead. It is a short 8 minutes’ walk from the bus stop to the beach. On the way you will see beautiful streets with many trees, gorgeous flowers and palm trees and beautiful houses. You might see a family of little monkeys walking around, they are also residents. That is it, you are at the beach!!! Just like every popular beach in the world, Itacoá has its own sectors, and there are three of them here– Costão, Meio and Pampo – plus the “prainha” (little beach). You might want to choose in which part of the beach you want to stay according to your preference. Costão: located on the left side from who is arriving in the sand, next to the Costão Mountain. That is where you will find the “party people”, fitness crowd and also families with their kids and elderlies. There is also the Onda Natural kiosk selling really yummy natural sandwiches with insane fillings. Next to it there is Gustavo´s kiosk, a very cool environment with a beautiful rustic decoration and a DJ playing house music, jazz, blues and a lot of rock and roll up until 9pm. Do not forget to try their cocktails. Meio: the word “meio” means “middle”. It is the closest spot in the beach for those coming from the bus stop. It is usually frequented by younger people like teenagers and school groups. Here you find Itacoalifórnia Kiosk that sells snacks and a delicious açaí. If you are willing to spend more Money for a fancy place, there is also the Noi kiosk which offers meals and craft beer, all by the sea. Pampo: it is on the right side of the beach and it is named after the Pampo Rock, that also names the Pampo Club. It is known for being the ´legalized´ area of the beach. It is less crowded comparing to the other sectors and you will see families with children celebrating with the youth, university students, parents, sports lovers, rastafaris and playboys, all kinds of people enjoying together in Harmony. Elisa´s kiosk feeds every one with their magical fish cakes and banana croissants. If you go further right, after the Pampo Rock, you will find the “prainha”. It is mostly frequented by families with children and elderlies because the waves do not get too powerful there. All these sectors also have people renting shades and chairs and selling coconuts, beer, soda, water and juices. The hole beach counts on walking sellers who all kinds of things, from food snacks to sunglasses. They always have a smile on their faces. To return to Rio downtown you will have to walk to same bus stop where you came from and take the bus 38 – CENTRO. Again, pay attention to the letters CENTRO on the display. Get off the bus at the ferry station Praça Arariboia, in Niteroi downtown. That is where you will take the ferry boat to Praça XV, in Rio. I definitely recommend you visit Itacoatiara. Undoubtedly it is one of the most beautiful beaches in Rio de Janeiro, where you will be able to relax surrounded by stunning nature, but also enjoy a day full of fun and adventures, if that is what you are seeking. 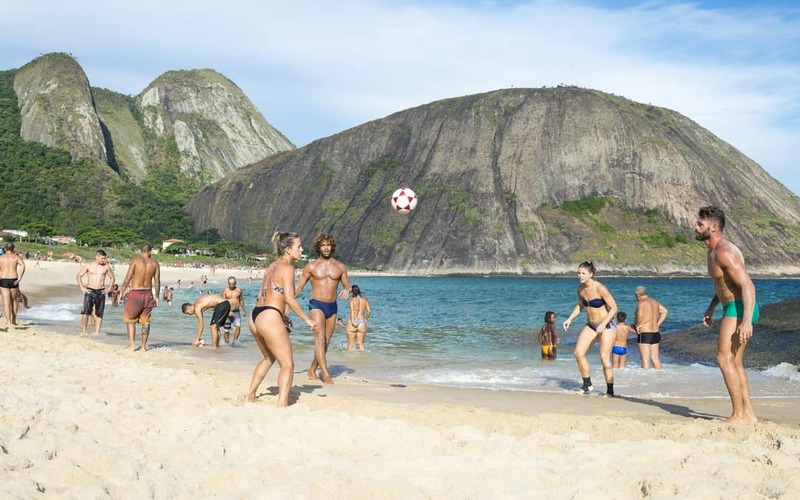 Whether you are Young, old, children or not, sports lover or not, Itacoatiara will Always be a beautiful experience for those who have the pleasure of being there. Article written by Tiago Ennes, a Brazilian traveller and enjoyer of life.